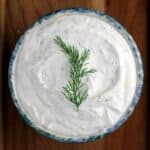 This Light and Creamy Horseradish and Dill Dip with dill and the subtle bite of horseradish is ready in just minutes, can be made a day in advance, and is insanely tasty. Serve with crispy Pringles as the perfect chip and dip combination. But also March because it’s b-ball time. Football ended, so there’s that void right? Basketball. Reason to get together and eat “game food”. Or even just to have on the tv in the background while I run around my house taking care of life. March is college basketball craziness, and Pringles are perfect for it because even plain, they rock. …but they are even better yet with a ridiculously good dip. …I will let you in on a little secret. In graduate school, I literally ate Pringles with cream cheese like all the time. 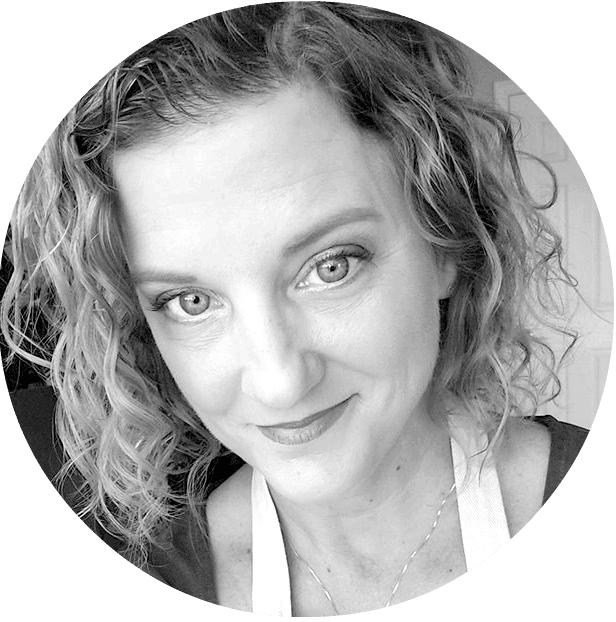 It was my first apartment, I had moved from Boston to San Antonio away from all my family, going through the torment of getting a PhD …what did I turn to for comfort? Pringles. And cream cheese. Not making this up guys. Not making it up. So all I did here was make a basic sour cream-and-mayonnaise dip. Then for all the flavor, I went with horseradish and dill (because they are made for each other), and solidified that relationship with a little Dijon and pinch of salt. 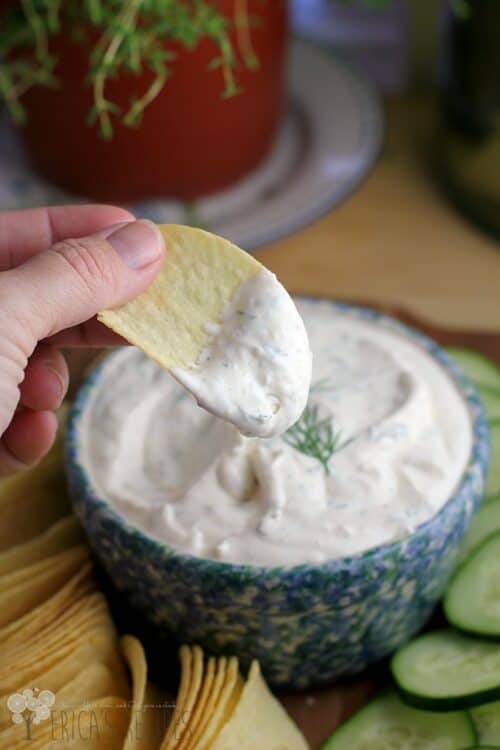 …of course, so you know (although I am sure it is quite apparent), this dip is good with Pringles, pretzels, chips, veggies, crackers, crudites, or just a spoon. So that’s it kids! 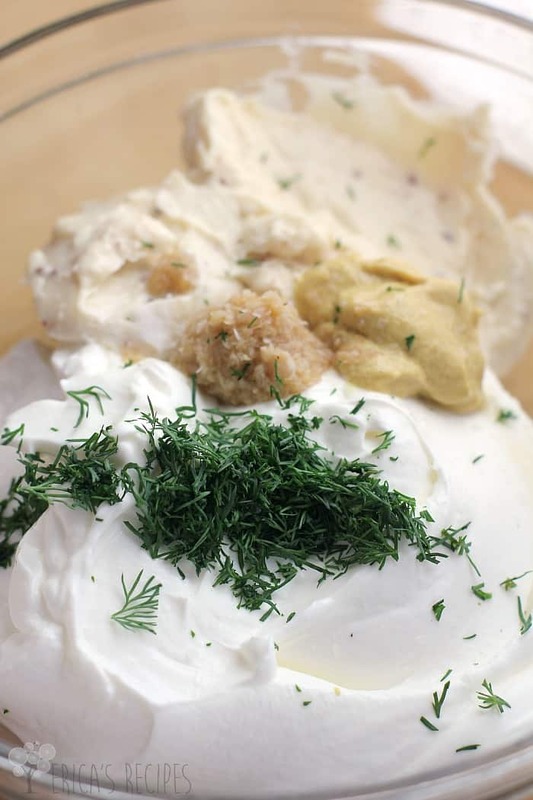 A creamy dreamy DELICIOUS Light and Creamy Horseradish and Dill Dip designed specifically to go with one of my favorite game-time munchies. Let this dip into your life and you will never go back to anything store-bought. 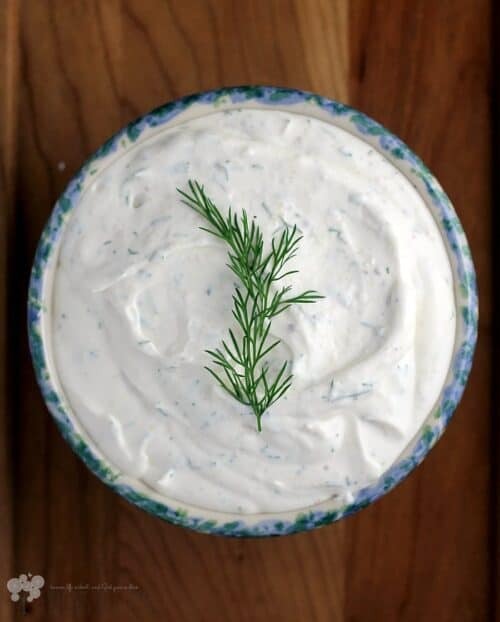 This creamy dip with dill and the subtle bite of horseradish is ready in just minutes, can be made a day in advance, and is insanely tasty. Mix the ingredients and refrigerate 1 hour to overnight to combine flavors. Serve with Pringles crisps and cucumber slices. Leave me a comment! What’s your favorite chip dip? This dip looks so stinkin’ good that I just want to dip a spoon in it! Pringles also happens to be one of my favorite brands of chips HA! I love a spicy dip, Ok any dip. This one sounds incredible. The perfect accompaniment to Pringles. Fresh dill is my favorite herb, so I know I’d love this! Great recipe! There is nothing about his dip I do not love. Those two flavors…yes, I agree! made for each other! Oh yum! I am loving the flavors happening in this dip! 🙂 I bet it does pair perfectly wit Pringles chips. I love how easy this sound to make, and being able t make it ahead of time is even better! I love how simple this dip is!! It sounds like the perfect flavor combo! OK, I’ve got my spoon ready. This dip would be perfect on so many things. I’m thinking as a sauce for beef. Love this combo! Yum, yum, yummy! 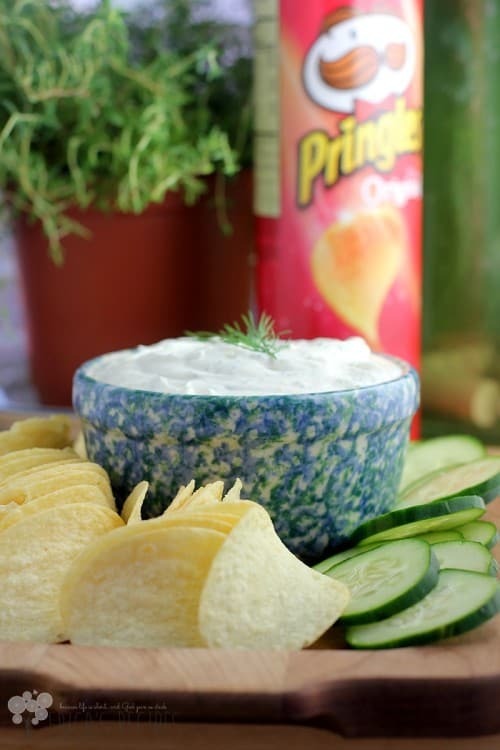 I love Pringles and this dip sounds like the perfect accompaniment! Sounds delicious! KC is right, it would be great with lots of things – like a great roast beef!! I am seriously addicted to chip and dip! This recipe looks amazing Erica, thank you for sharing. I know that if I start eating I will never stop until the bowl is empty! That good it looks! I confess I love Pringles. Never tried them with cream cheese, though! But this dip looks amazing, thanks for sharing!